What Is Going On? Justice Ginsburg Still Missing After Cancer Surgery Causing Everybody But The Media To Ask "Where Is Ruth?" Supreme Court Justice Ruth Bader Ginsburg has not been seen publicly for nearly two months, and since her lung cancer surgery she has not attended oral arguments in the Supreme Court, and has canceled multiple scheduled appearances. TMZ did publish a short video showing the top of a head of a person being helped into a car, without any face shots, claiming it ws Ginsburg. Yet the media who went absolutely bonkers while the First Lady Melania Trump was recuperating from kidney surgery and wasn't seen publicly for a few weeks, apparently has no interest in updating the public on Ginsburg's condition and well being, yet others are asking "Where's Ruth?" 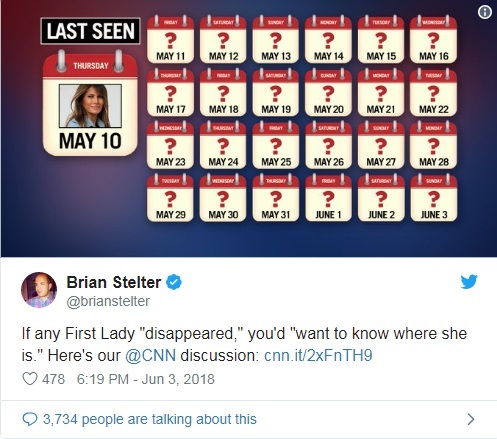 Back when Melania was recuperating CNN even made a handy little graphic for Brian Stelter to tweet out, a calendar running from May 11 to June 3, 2018, with question marks on each day, and an image of Melania in the upper left corner under the words "LAST SEEN," with the date "May 10." Stelter tweeted the graphic with the comment "If any First Lady "disappeared," you'd "want to know where she is." Here's our @CNN discussion: http://cnn.it/2xFnTH9." While I grant that the public is interested in our First Lady, Ginsburg has a lifetime appointment to the highest court in the nation, the Supreme Court, and should she be forced to step down because of health issues, or if she passes away, President Trump would get a third Supreme Court nominee in just his first term, so we have to wonder why the media seems to have no interest in where Ginsburg is or when she will return to court. "Trump Allies Think Ruth Bader Ginsburg Is Hiding or Dead. It Started on QAnon" by The Daily Beast. "Ruth Bader Ginsburg death rumors proliferated online by QAnon, former Trump adviser," by Newsweek. "Former Trump staffer spreads gross QAnon conspiracy theory that Ruth Bader Ginsburg is secretly dead," by Salon. "Pro-Trump Conspiracy Theorists Running With Claim Ruth Bader Ginsburg is Dead or In Hiding," by MEDIAite. MEDIAite provides some comments made over on Twitter by right-wing pundits, like Tony Shaffer that links to an American Thinker story, stating "Where is the Notorious RBG? Ruth Bader Ginsburg watch nears the end of its second month..." They also highlight conservative actor James Wood who asks "Seriously though... 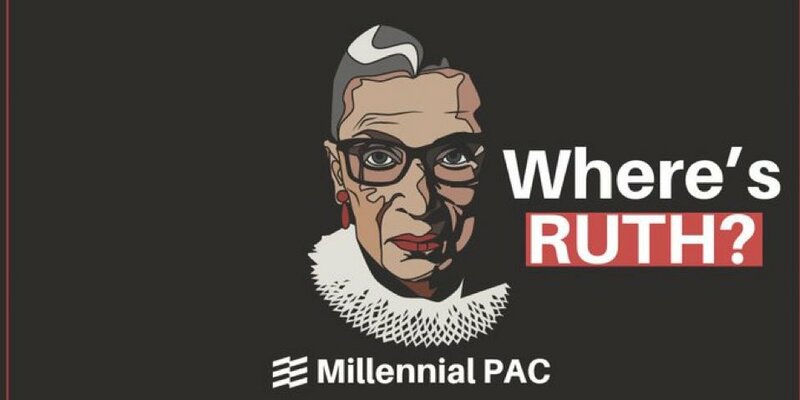 #WheresRuth?" 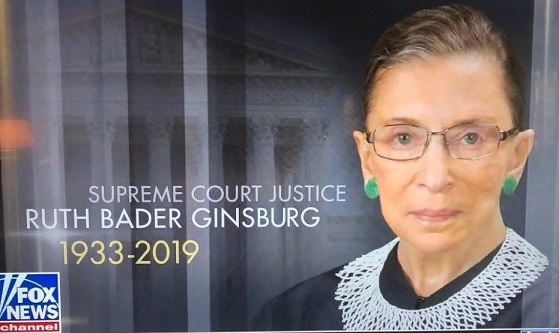 Wayne Dupree asks "Anyone seen RBG?" Last but not least for examples, MEDIAite shows former Trump advisor Sebastian Gorka's tweet stating "Still no sign. 6 days left until Ruth Bader Ginsberg has to make her official appearance at @realDonaldTrump’s State of the Union." A quick note about Gorka's tweet - Ginsburg, in fact no Supreme Court Justice, is required to appear the SOTU address, but after Fox News' accidentally showed a graphic on-air that indicated that Ginsburg had died in 2019, blaming it on a "control room error," along with the 85 year-old's frail health after breaking a few ribs in November 2018, then the cancer surgery in December, the optics of her not showing up, as well as not being seen in public, wouldn't be advantageous to anyone. Granted the "autists" over on 4chan and other forums have come out with some pretty wild theories, including claims that Ginsburg is in an induced coma, or brain dead, and there are many "weekend at Bernie" comments flying around suggesting she passed away and "they" are pretending she is still alive so President Trump doesn't get another Supreme Court pick, but to suggest that legitimate questions about her health are some type of conspiracy, seems suspicious after the liberal establishment media made such a fuss over Melania not being seen in public for a far less amount of time. That same point is being made under the #WheresRuth hashtag on Twitter (Which James Woods is using quite frequently), with users highlighting "It only took 20 days for all mainstream media to freak out about the 1st lady Melania Trump, questioning her mental &/or physical health. And yes...they did freak out. The conspiracy theories ran amock," attaching a screen shot of a CNN story titled "Melania Trump hasn't appeared in pubic for 20 days." Others are asking for proof of life, and there are a bunch of memes in that hashtag, but the overwhelming majority are simply wanting to know "Where is Ruth?" The media's lack of coverage, lack of concern on this issue, is only creating more theories, some outlandish, and some legitimate questions about whether they are trying to hide something. It has been 54 days since Justice Ginsburg has been seen. Any other high profile personality, and the media would be all over it, speculating as they did with Melania, where liberals claimed she could have moved out of the White House, asking if she was hiding because President Trump beat her, working with Mueller, and a whole host of other silliness, all incited by the media's "Melania Watch," clickbait articles. As long as Ginsburg handlers keep her under wraps, more and more theories are going to be posed because in the absence of legitimate news, people are prone to curiosity and imagination. Ginsburg's handlers need to take a picture or something, show the country she is indeed still alive, and recuperating, or they can expect more of the same. The media also needs to do their jobs, investigate and report on her actual condition, otherwise the #WheresRuth movement is going to explode.